How to create teams (or leads)? How to view projects, tasks and issues? You need to be a project owner or an administrator to assign tasks to other users. Select the tab Projects from main menu. Locate the task you want to assign and click to open the task page. Click the link Assign task (you can find the link just below the task description), select users and permissions. 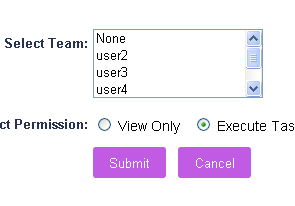 You can give the user either View Only or Execute Task permission, depending on what you require from the user. If you would like the user to only view the task, then select the view only option. The user will then be able to view the task correspondences and documents, but that would be all. If you would like the user to carry out the specific task, you will be required to select the execute task option. By selecting this option the user will be able to correspond and complete the task that has been allocated to the user. You can see view-only tasks in project and project view page. 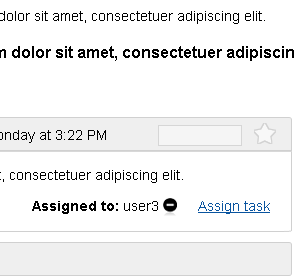 When tasks are assigned to user as view-only the font color of the task appear in grey color which indicates it is view-only task. View-only tasks can be useful in assigning task to users where you don’t want the user to comment or attach files to task but only watch and download content of that task.